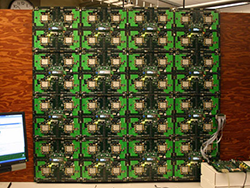 Computer architecture research at UW CSE encompasses the structure, organization, implementation, and performance of the basic building blocks of computer systems. Many of our faculty and students take an inter-disciplinary approach to research that crosses multiple layers of the systems stack - from hardware to programming languages and applications - as part of our SAMPA group, a collaborative effort focused on computer architecture, operating systems, compilers, and programming languages to make computer systems faster, more reliable, and more energy efficient. Approximate computing: We explore the tradeoff between accuracy and performance and seek to exploit the ability of many applications, including augmented reality, machine learning, and big data analytics, to tolerate inaccurate computation at various levels. By trading accuracy for approximation in computation, storage and communication, we aim to develop comprehensive solutions across the entire system stack that will improve energy efficiency while enhancing systems performance and features. Emerging applications: Applications are often a major driver of progress in computer systems architecture. We seek to develop solutions for large-scale data analysis – making it simple to write irregular applications with near-optimal system utilization – and better support for scripting languages and optimization of web browsing on mobile devices. Emerging technologies: The advent of new basic technologies is another main driver of new systems. The emergence of large, fast non-volatile memories (NVRAM) provides us with an opportunity to reimagine operating system design. Another exciting line of inquiry is focused on engineered DNA molecules, which offer potentially life-saving applications by enabling computation inside living cells. UW CSE’s computer architecture group has a proud history of innovation with tangible impact on the field of computing. The now-pervasive simultaneous multithreading was developed here. Our WaveScalar project showed that imperative programs can run in a data-flow fashion in a highly scalable architecture. We also demonstrated that it is possible to make multicore systems more reliable by controlling inherent non-determinism and automatically avoiding bugs without compromising performance. Our faculty are highly entrepreneurial, and several technologies have been successfully commercialized based on research conducted at UW CSE. Many of our alumni have gone on to join industry leaders such as Amazon, AMD, Apple, Google and Microsoft, or have accepted faculty positions at prestigious academic institutions.